We bring the Lego party FUN to you or you can come to our new retail store! We have a party room dedicated to fun with Lego bricks and products! We buy, sell and trade anything Lego! We add new stock almost daily! We sell new and used sets, individual pieces by the cup, build a fig to make your own, 1000's of stock and custom LEGO figures, 1000's of custom and LEGO accessories for figures and we sell some Halo and other brands of mini figures too! We also have some custom creations on display in the store . Custom engraved LEGO piece GIFT CARDS are now available! They come in one for a free birthday party and in $25 increments, cooly printed right on LEGO bricks ! 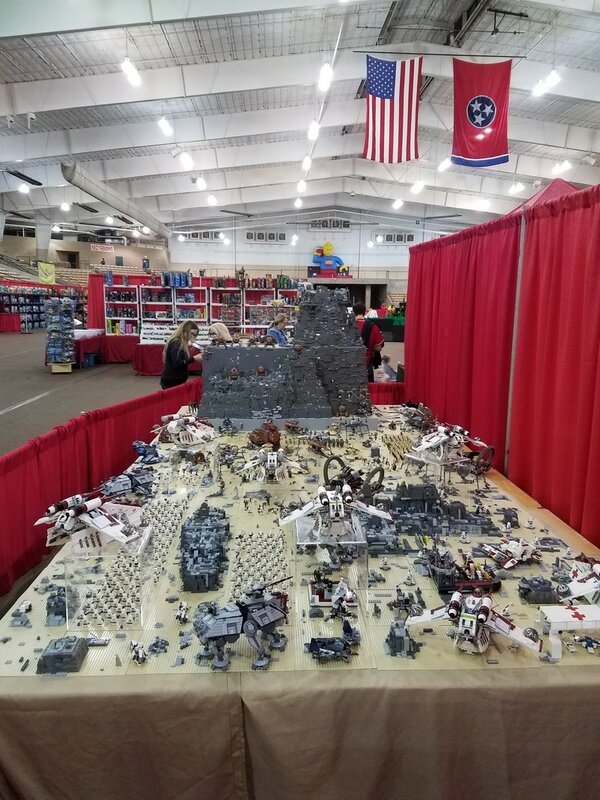 Brickworld Fort Wayne! 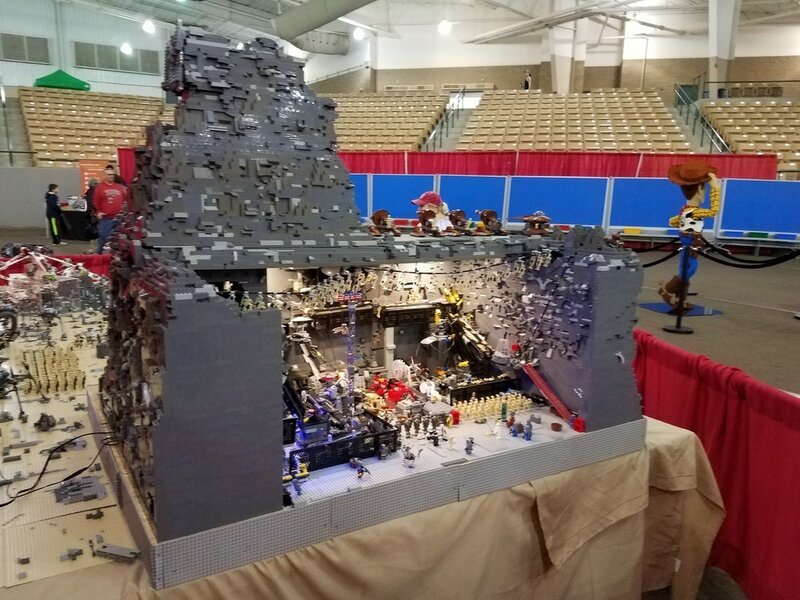 This is a glimpse of one of the shows we attended, our displays are the two Star Wars displays, the first the ice planet Hoth and the second is the battle for Geonosis in the second movie "Star Wars: Attack of The Clones"
Parties are for Lego fans of All Ages! Our parties include us bringing a great selection of organizers full of Lego mini figures with lots of accessories for the figures. We let each guest assemble a Lego figure of their choice with an accessory item and customize their person. We have several stations that are appropriate for any age group to play, usually open all at the same time. With all the stations open guests can bounce back and forth as they like. We bring large totes of loose Lego bricks of all shapes, sizes and colors to host building activities for each person to do. For younger ages we can let the parents help or they can try on their own and we supervise and help too. We have each guest show off the creation they made and we have a great time. When the building is over we turn the party over to you for cake and ice cream while we clean up the lego party area. We have lots of different options for the party. Party Favor Lego Set (new in bag & LOTS of choices) for each guest to take home for only $4.00 to $5.00 per guest (choice of things like an airplane, jeep , space ship or surprise mini figure etc). These also make great stocking stuffers or sets for gifts too! Table rental (if you need extras) $5 per 6 foot table. If you provide tables please remember that Lego bricks are heavy and folding card tables do not hold up well sometimes. We need at least a dining room sized table for open play and an additional 6 foot table for the other stations. Lego sets can be purchased thru us for various prices depending on the size, the rarity and how long the set has been retired. We have a huge selection in our retail store at 6025 Madison Ave, Indianapolis. We have many sets not in the store and we will search for specific sets for you also. We hope this information is helpful and we look forward to hearing from you soon. We will make your birthday guest of honor very happy! For further pricing please visit the "Options and Favors" page, thanks!